Koolway Sports has made the most wonderful jacket for our son Tommy. He will be 6 in Nov. and has CP and spastic muscles so severe in his upper extremities that getting his shirts on and jacket was awful. His new spring/fall jacket just unzips fully, slips over his head, slip in his chest harness straps and zip the …arms from wrist to waist and off you go. No struggling to put jacket on backwards or to get arms in sleeves. No blanket falling off or tucking in. Boot/blanket combo just zips to waist and keeps wind and cold off his legs. We just love it. If only everyone could have one the kids (or others) would be so much more free to come and go with ease and comfort. Parents won’t need to struggle with every day outer wear. We have enough to deal with already. As a parent of a child with special needs, I am always happy to share my knowledge and information with my peers. 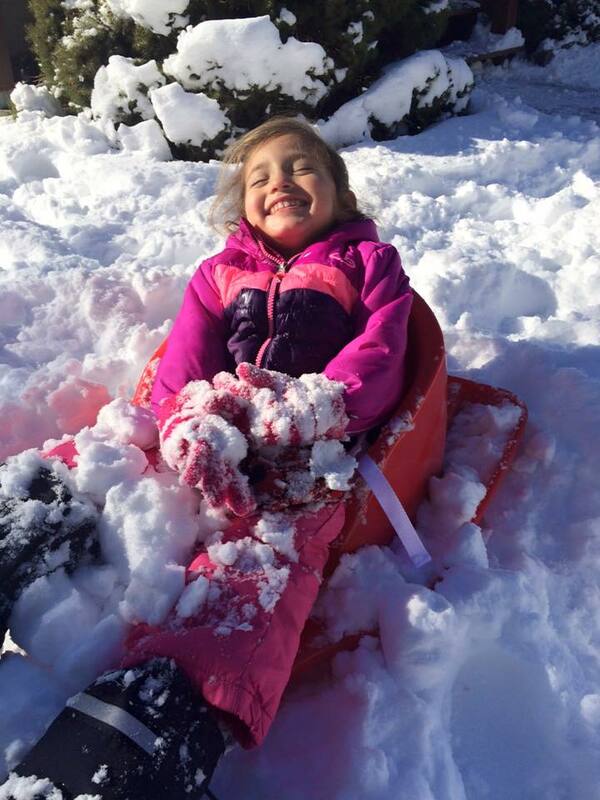 So it is with that in mind that I share my daughter Maya’s experience with her Koolways Koat. Maya is almost 10 years old. As my daughter grows, we find it has been harder to find winter coats that were big enough to fight her high-toned arms into. For those of you who have children with high tone, you know that it can be a bit of a struggle to get tight limbs into small holes! I also found it increasingly difficult and time consuming to put on her coat where I would need to get one arm in and then twist the rest of the jacket through her lateral supports on her power chair and then around to the other arm and twist that arm in as well. Regular winter coats were bulky in behind her and would make the lateral supports very tight, especially at the end of winter when she would have grown a bit. Another issue we always encountered was keeping her legs warm during the winter months. Forget trying to get her into snow pants! That WASN’T going to happen. It was hard enough getting the jacket on! But children with cerebral palsy get particularly cold in the winter, as they don’t move enough. I wanted her to be able to go outside to play at recess but she was never able to before because it would be too cold for her. On the really bitter cold days, I would have to place a blanket over her legs from the house to the bus or the car. But that wasn’t a long-term solution of course because the blanket would inevitably fall off and get wet. One day I asked one of Maya’s therapists what other parents do in our situation. She referred me to an online company called Koolway Sports. I looked at their website and saw these beautiful jacket sets with an attached “blanket” that would cover Maya’s legs and feet. I called them up and they were super nice. They quoted a price in around the $500 range and explained that the suits were custom and handmade in Whitby, Ontario and that ALL their materials are made in Canada. I felt that this was going to be an investment into our daughter’s comfort and once I made the decision to purchase one, they advised me how to measure Maya properly. We were so thrilled with the final result! Instead of having to fight tight limbs into the jacket, the jacket zips up around the arms. They also make the back of the jacket shorter so that you don’t have to tuck a bunch of bulky material in. 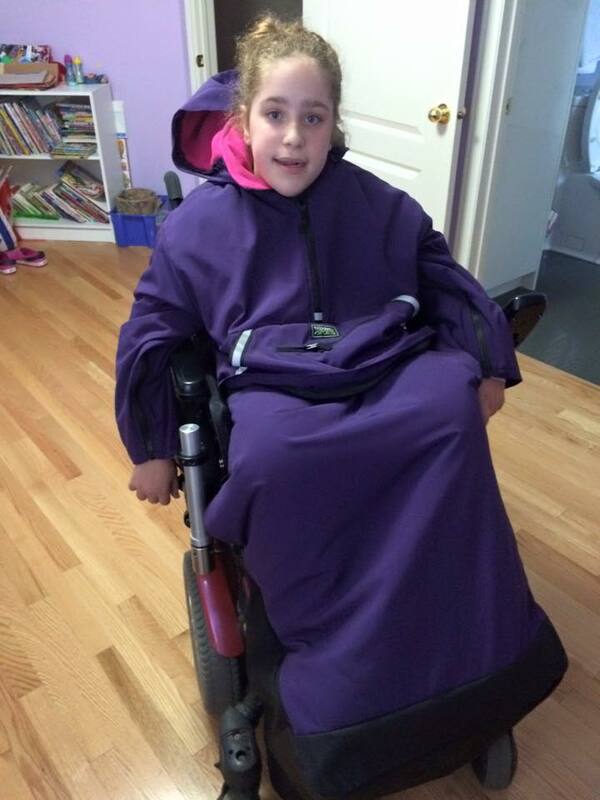 The “blanket” easily slides over Maya’s footrests and zips to the bottom of the coat. When she is fully dressed she looks like she is in a sleeping bag! The material is so warm and cozy. There are zippers at the top of the jacket that her chest strap fits through so they don’t need to be on the outside of the coat. We also purchased accessories such as hats and mittens. Maya’s has a bit of an odd-shaped head due to her hydrocephalus, so she never seems to properly fit into a regular winter hat. I measured her head and we got a beautiful hat that was so warm and fits her perfectly! The mitts come with a slit on one of them to accommodate a stick shift. This way, Maya does not need to take off her gloves to drive her power chair, something that she ALWAYS had to do before. As you ALL know, this has been a particularly difficult winter. But I was so grateful to Koolway Sports for making a wonderfully warm and cozy winter suit for Maya. It made everything a bit more manageable. I would definitely recommend them to anyone with a child in a wheelchair!